The city of Del Rio, Texas, is located in Val Verde County on the Texas-Mexico border, midway between Padre Island and Big Bend National Park. The city is eight miles south of Amistad National Recreation Area which surrounds Lake Amistad, formed by the Rio Grande, Pecos and Devil's Riverswith 850 miles of shoreline. Del Rio is immediately across from the International Bridge that originates in Ciudad Acuña, Mexico, and is seven miles east of the Air Education Training Command's Laughlin Air Force Base. 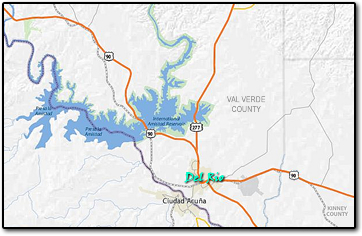 Del Rio is on U.S. Highway 90, running east-west and U.S. 277, running north-south. It is 150 miles from San Antonio to the east and 154 miles from San Angelo to the north. It is served by the main line of the Union Pacific Railroad and Amtrak. About 40,000 people reside in the city. The city is at an elevation of 999 feet, and has an average annual temperature of 72 degrees with an annual average of 18.80 inches of rainfall. The climatological summary reflects a maximum average temperature of 80.9 and a minimum of 58.5i with June being the hottest month and January being the coldest. 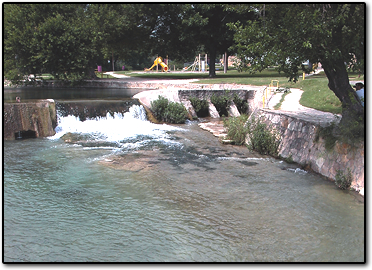 In a semi-desert locale, Del Rio is an oasis with San Felipe Springs flowing 150 million gallons of pure water per day through creeks and canals which border recreational facilities including parks, municipal swimming pools, tennis courts, golf courses, and facilities for baseball, softball and soccer. Water and a temperate climate make Del Rio a recreational mecca, with many modern motels and campgrounds. Sportsmen enjoy hunting, fishing, golf and tennis throughout the year. Local attractions such as Seminole Canyon State Historical Park, the Judge Roy Bean Visitor Center, Whitehead Memorial Museum, Laughlin Heritage Museum, George Paul Museum, Val Verde Winery - the state's oldest winery, and Shumla School – attract many travelers, as do annual rodeos and fiestas. Amistad National Recreation Area, supervised by the National Park Service. Includes Lake Amistad which provides outstanding opportunities for boating, sailing, scuba diving, fishing and outdoor activities. The Park also includes a diversity of flora and fauna that can be seen from the various nature trails and numerous archaeological sites consisting of ancient Indian Pictographs. The National Park Service hosts educational and nature programs and maintains the beaches, campsites and boat launching facilities. Concessionaires operate marinas, boat storage and fishing guide services. 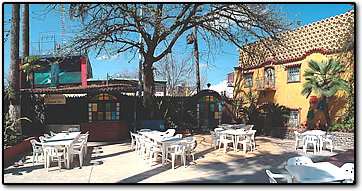 Cultural activities are largely provided by The HeART of Del Rio an association of Art Galleries with a very diverse clientele and unique patrons. The First Friday of every month, each member hosts an opening receptions for featured artists. The participating venues include Garden of Arts Gallery at Amistad Florist, Vevilu Gallery, Del Rio Council for the Arts Firehouse Gallery, Lee-Bunch Studio Gallery and Casa De La Cultura - A Project of El Comite Cultural Del Pueblo, Inc. 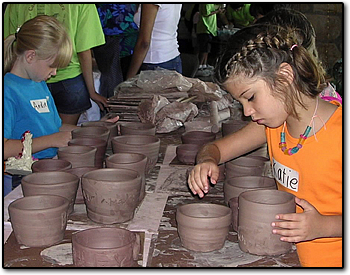 The Council for the Arts, offers a variety of art exhibits, and offers arts, crafts and educational classes. Casa de la Cultura, a cultural arts center in the barrio of San Felipe, offers classes in clay, ballet folklorico, pinata making, guitar, and other traditional cultural arts. Concerts, touring groups and recitals at the Paul Poag Theatre for the Performing Arts and The Upstagers Community Theater Group, combine to provide entertainment and enrichment. There are many national, civic, educational and service organizations represented in Del Rio, as well as many unique local groups such as the Maquila Wives Association, which was the first of its kind, and Border Patrol Wives Association. The religious needs of Del Rio are served by 47 churches representing 19 denominations, including Catholic and Protestant. The Val Verde County Library has a collection of over 58,000 volumes and an extensive reference collection. As a member of the San Antonio Area Library System, it has regional, state and national access to virtually any book through Interlibrary Loan. The many shopping areas encompass everything from the well-established family business to large national chains located downtown, in the mall and various shopping centers. Del Rio and Ciudad Acuña offer unique shops and stylish boutiques throughout the two communities. Del Rio's news media include a daily newspaper, The Del Rio News-Herald, and four radio stations, KDLK-94.3 FM, KTJK-1230 AM-Puro Tejano, KTDR-96.3 FM and KWMC-1490 AM. In addition, Time Warner offers 49 basic television channels and many premium channels by subscription.